A new wave of strikes against austerity measures are under way in Greece as unions react to social security changes ahead. 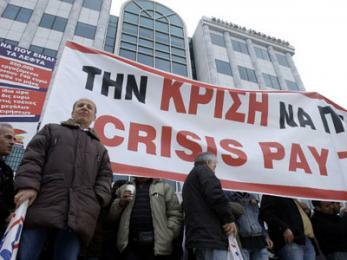 It has been a lukewarm return to the pre-Easter labour mobilisations, but it seems that another strike wave is on the rise in greece, once again against the austerity measures imposed under the constant shadow of the possibility of the country coming under IMF supervision. Last week, taxi drivers performed a two day strike, while lawyers withdrew their labour for three days. This week the strike forecast, as the media have dubbed it, is more dense. Kiosks will be shut for 24h across the country, a vital strike at the local day-to-day economy. At the same time PAME, the Communist Party controlled union umbrella has declared a 48h strike starting tomorrow, which will be joined on Thursday by the overall public sector union umbrella ADEDY. The ADEDY 24h strike will see all state-run business and services shut, including the greek airspace with no flights performed. GSEE, the private sector union umbrella is holding talks with the government on Friday before deciding on new strikes on its part. The focus of the present strikes is to prevent any anti-labour changes in the social security law, an almost certain possibility that has placed the Ministry of Labour under considerable EU pressure. The minister has pledged that pensions up to 800 euros per month will not be affected, but higher pensions will lose up to 300 euros per month. Indicatively in terms of the real value of this, a loaf of bread costs from 70c to 1.10 Euros, while an espresso 1,5 Euros take-away, 2.5 Euros sit-in. Taxikipali - you say that "lawyers withdrew their labour for 3 days" last week. How did that effect things? Are lawyers on our side? What is the situation of lawyers in Greece? In France, about a year ago or so, both judges and lawyers not only withdrew their "labour" (is it really "labour"?) but also confronted the CRS and were tear-gassed; some (even judges) chained themselves to railings and demagoguically compared themselves to "sans-papiers". But they soon went back to their assigned role of sending those who contravene the laws of private property and commodity relations to prison. Are they really part of the struggle? And even if lawyers are pissed off with the government's policies in Greece and elsewhere, don't their lucrative positions and idelogical function and attitudes make them rather like champagne socialists/ caviar anarchists or whatever? I think lawyers are also becoming proletarian. In turkey traditionaly lawyers generally tended to become petite burgeois who owns their own small offices. But now "the law market" is getting opened to the big law companies that maybe hundreds of lawyers work for a salary of around 600-700 euros. Some of them are working even lower wages since with the new regulations some law departmant graduates are never getting the eligibility to become lawyers and are only working for foreclosures or other office works. This has already created a tension between petty burgeoisie traditional old generation lawyers' organisations and worker lawyers which wanted to be recognised as workers and all the implementations that this required. I agree with mikail. I think that in Greece lawyers are generally speaking quite far from anything related to champagne or caviar...the trade is really huge with most of them employees or in a one man/woman business. There are very few big solicitor officers like you see in other places of Europe or the USA. As about their politics, the lawyers associations are generally PASOK controlled, but strong leftist tendencies in them exercise considerable influence in public affairs. This does not of course mean that lawyers as an institution are not problematic. Today the offices of Salonica's Lawyers Association were occupied by anti-authoritarians in demand for the release of Marios Z., the remanded swimming instructor arrested during the last general strike. Update: The court clerks have announced a 48h strike, while doctors have already gone on a 48h strike for today and tomorrow. Theater actors have announced they will withdraw their labour today with all performances across Athen's 200 scenes canceled (Wednesday is one of the most popular theater days in the week) in response to the austerity measures. Since the early morning the harbor of Piraeus remains blockaded by dock workers allied to PAME after their 48h strike was judged illegal by the courts. No boats are allowed to leave the port as a result of the action. At the same time the center of Athens remains closed due to a students protest march in protest to the proposed educational reform announced recently. Un-hired teachers have pitched tents outside the Parliament in protest to the not fulfilled promises of their employment. Update2: Both the PAME and the ADEDY protest marches of Thursday concluded in Athens today. During the ADEDY march students threw garbage to police forces guarding the Ministry of Economics where IMF officials were meeting with government officials. The police responded with tear gas but was forced to retreat as the entire march stood still demanding their removal. Otherwise the turn-out in both marches was very small for the occasion, 7,000 for PAME and less than 3,000 for ADEDY. In Salonica PAME workers tried to invade the City Hall but where pushed back with brutality by riot police forces. Any idea why there are so few - given the enormity of the ruling class's attack - involved in the various struggles, particularly on the demos? Is fear eating the soul of resistance? And if so, why are people not confronting their fears? (my questions are, basically, what do you think? and what are other people saying about this?). What is PAME's strategy in Piraeus as mediators?How do they tame the struggle - by playing militant radicals then quickly resuming their cop function, or what? How do you see this struggle developing, given past experience? As for the lawyers - well, some are becoming proletarianised, albeit with ideologies that still defend their specialism as something absolutely indispensible, but many just remain Middle Class, even if they have an 'anarchist' ideology - many of them 'support' the struggle, but rarely risk anything themselves,no? Apologies for all these questions (someone in an earlier post said my questions were 'interminable' iirc) - obviously take your time, and maybe there are other Greeks reading this who could also help answer them. I ask them because Greece is as important as Italy was in the 70s - and a defeat there would be even more demoralising than Italy in a very different epoch. We need to understand as many nuances of the struggle as possible whilst it's unfolding, not when it's too late to influence, or be influenced by, events. Correction: In Salonica, the workers that invaded the City Hall were not from PAME (CP-controlled union). The demonstrators that took part in the demo of autonomous unions and ADEDY, continued after they arrived at the G.Secretary of Macedonia-Thrace (North Greece) and went to the City Hall to put a banner, protesting for the lay-offs that are scheduled. The police attacked brutally the gathering outside the city hall, while some workers were already inside. The mistake is understood, as taxikipali is probably not from Salonica, and it is actually a media mistake. About Samotnaf's questions, i would say that, OK, fear is a factor, and also the idea of 'OK, they are attacking us and it's unjust, but what can we do?' is present amongst the population. This, of course, along with the idea of 'national unity against the crisis' is the a trick that is being promoted by the mass media for months. People are enraged generally though and these tricks can't calm down those who see that finding a job is extremely improbable, despite their effort all these years, and even more for those that have a job, but are now fired. Actually, it's difficult to say what is really happening, as the situation is not a usual one and the reaction of all these people is unpredictable. We didn't have a situation like this with so many fired (or threatened to be fired) people in the near past, and i personally can't make a prediction. About yesterday's demonstrations, you have to know that GSEE (private sector umbrella union) did not proclaim a strike, so most workers couldn't take part! Actually today they are having talks with the government. Their whole practice is completely outrageous and simply justifies the workers that attacked their president in the strike of March. from_greece thanks for the correction...my mistake, sometimes the distance of the two cities distorts reality a lot. I agree with the estimation that it is hard to estimate anything at the present climate. The PM has just announced the country entering IMF supervision, an unprecedented move for Euro-zone countries and the first time (as far as I know) that Greece comes under the IMF. The base unions have called for an immediate protest march this afternoon in Athens but not much else apart from people lined in banks to withdraw their money in moving about in the capital. I dont think fear is a major factor; guilt is. Everyone is saying that "we have all stolen and now we will pay" a statement not too far away from reality actually as corruption from top to bottom of the social hierarchy is rife in the country. Of course the government cultivates this guilt feeling to the maximum in order to forge a national unity. The IMF might be the thing that further enhances this social situation, as now everything can be blamed on imperialism, a favorite sport in greek politics that embraces all party ideologies. Sam, to be honest I am not sure what the KKE and PAME are doing down the harbour, its a very special labour case as a whole and difficult to approach from the without. For sure ship-workers are traditionally KKE allied, a thing that does not look like changing in the near future. Note: Marios Z. the protester arrested during the latest general strike has been released. Yet the 19 year old anarchist girl wanted for the NFC case who had published an open letter (translated in libcom at the time) was arrested while walking in the center of Athens and remains in custody. from_gr, taxikipali - thanks for that. Is there much in the way of texts attacking such guilt? I find it amazing that people are so maschistic they blame themselves for the punishment meted out by the IMF, whilst at the same time attacking them for "imperialism" (which makes them clearly the 'guilty' ones, I would have thought). But I wonder if 'guilt' (ie feeling responsible) is an excuse for cowardice - what little I know about dominant Greek culture, admitting your fears is not part of it, at least for men, and particularly as many people in Greece, despite the fear, are daring to do things against this society. In such a social context, to give fear as a reason for not confronting the rulers' attacks would seem pathetic, so 'guilt' (encouraged by religious conditioning, maybe?) can seem reasonable. Of course, admitting your fears does not at all mean cowardice in itself - only when you give in to them can you rightly be attacked for timidity. Update: The protest march called after the IMF announcement and performed with only three hours preparation in Athens numbered around 4,000 people a very good number given the short notice. The march was vibrant with rage with clashes erupting at Propylea when protesters attacked the riot police with rocks and molotov cocktails while the central Zara department was smashed. As a response the riot police forces mounted a counterattack on Exarcheia where flaming barricades were erected to halt their advance. Riot police forces surrounded the self-managed park of Navarinou and attacked the people sitting in it with characteristic brutality. Note: a 15 year old girl was arrested in Exarcheia last night and is in custody at the National Police Headquarters accused for participating in the attacks against riot police forces after the march yesterday.